Fotor was recognized by the Web Marketing Association (WMA) with the 2017 Webaward for Outstanding Achievement in Web Development. The latest nomination of honours follows the release of Fotor from a Flash-based platform to a fully-fledged HTML5 conversion, and will be used to provide an improved user experience for all Fotor platforms, to enhance the Fotor Team, and expand Fotor’s global exposure and reach. It was not a simple task for Fotor to implement the conversion from Flash to HTML5. As a celebrated online photo editing and design platform, Fotor has a considerable user base and had created comprehensive features and tools for their use. The Fotor Team needed to ensure the preservation of the user experience, alongside the continuance of all functionality and the performance of each feature. Fotor’s conversion process started in 2016. A number of browsers started to downgrade their support for Flash-based sites in as 2017 began. As you can imagine, this was a nightmare for the industry and the Team was in a race with the clock to keep dissatisfied users. Meanwhile competitors were striving to instruct users on how to navigate an unpleasant experience. By this time however, Fotor had already move to the next stage. Following 10 months of intensive development and testing both in-house and online, the new version was finally launched. To ensure an improved user experience, the Team developed some cool new features to make what was great even better. Syncing work and photos to the Fotor Cloud, supporting HD PDF saving for easy printing, and the addition of handy tools under Design. There are no limitations for any user at Fotor. 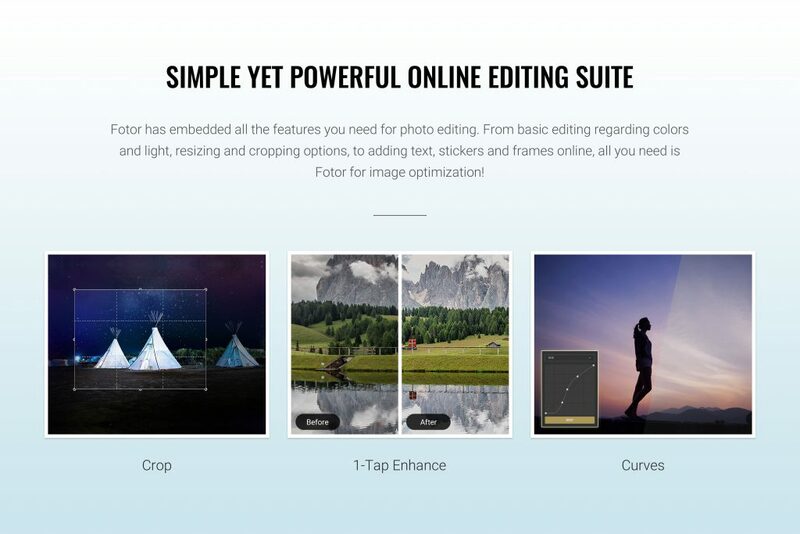 Fotor was first launched in 2012 as an all-in-one, photo editor and collage creation suite and was quickly dubbed “Photoshop Lite” by the BBC Fotor is a renowned graphic editing and designing suite, utilizing technology to bring digital editing to anyone, anywhere. 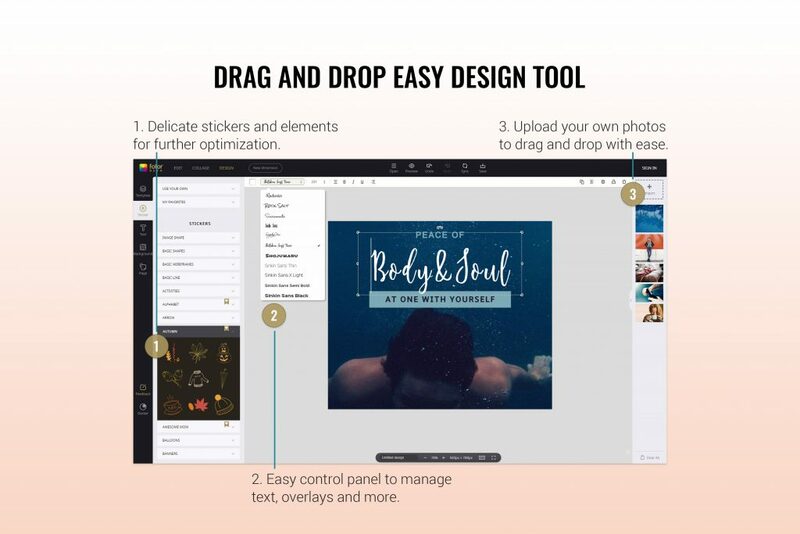 Its design features give users the ability to design graphics where the only limitation is their imagination, and Fotor is successfully competing in the Photo Editor, Collage, and Graphic Design applications market. Fotor has upwards of 250 million users in more than 180 countries, received Top Developer in Google Play and, in the category of Free Photo Apps, placed 1st in more than 100 regions within the Apple Mac photographic community. In the end of 2015, Fotor launched its graphic design feature. That’s where Fotor for design comes in. Fotor offers a variety of editing options that appeal to prolific bloggers, designers, account managers, and such. People need to be able to create new graphics quickly and inexpensively within an application interface that’s sleek and minimal. Most features in Fotor are free of charge. However, users can subscribe monthly or annually to upgrade their account and enjoy premium functions. Fotor has grown rapidly in a fairly short span of time, and currently reaches more than 40 thousand subscribers. Looking to the future, at the moment Fotor’s main templates are designed by in-house designers. However, Fotor has begun recruiting freelance graphic creators to generate templates that are rich in design. In an effort to create a persistent flow of fresh and high-quality content on all of our sites, Fotor is in the process of enhancing the Fotor community through the implementation of user-generated content. Users can contribute to our content creation efforts by sharing their designs, and re-designing the work of others. This capability increases engagement on Fotor and lets users tap into everything shared on the web. Additionally, the launch of Fotor’s own site of stock photos, with images sourced from Fotor apps, lets users purchase images at a much lower price when compared with traditional stock photo sites. Our Challenge section, presents a series of photographic contests with various topics that are updated each week. To date, Fotor has collected over one million photos that users have given us permission to sell. Tempura Communications, an already well-established and respected communication business, approached Rooster Marketing with a new venture; Tempura Connect. This new business arm would take the form of a fully functional, commerce and subscription based telecommunication service. The hub of this new direction would be established online via a new and engaging website; designed, developed and built by Rooster. As a business offering, Tempura Connect strives to “connect productivity” by offering a variety of end-to-end hardware, services and network options that can either be purchased outright or acquired via a monthly subscription. This package solution means, that for businesses, there are no installation fees, instead, they pay for the use of equipment on a monthly contract. Due to the nature of Tempura Connect’s business package, their services result in muchly reduced telecommunication costs for their clients. As a natural consequence, their predominant audience comprises of start-up companies, in the main. This was carefully considered in the initial wireframing stages of the new website and today is reflected in the site’s design: clear mega-menu bar, bold colours used to communicate affordability and a simple interface was implemented which has resulted in a satisfying user experience to highlight Tempura Connect as a problem solving business. This being said, Tempura Connect still wanted to be communicated as a professional and respected provider. This too was considered and deftly integrated into the website’s overall feel via fully functioning e-commerce capabilities, including a Woocommerce platform with a member’s area and subscription function that allows user to pay for packages on a monthly, quarterly or annual basis. 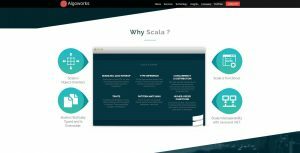 The site was also a custom build that was developed onto the WordPress platform, offering the best of both worlds: a fully bespoke and uniquely designed and developed website but running on an easy to manage CMS with an easy to navigate interface. In doing so, this meant that we didn’t tie Tempura into any long-term ongoing costs – if they chose to manage their site in-house we would provide the training to allow this. The site as a whole functions seamlessly, looks clean and modern and explains Tempura Connect as a business service effectively – with informative copy and clear calls to action. All of this further guides and improves the user journey, which, in turn, crucially boosts business-client regard and trust. Although we are thrilled with the result, being a new business venture it was unclear how many different offers and packages there would be in Tempura Connect’s future. In hindsight, if we had known this at the start we would have likely incorporated more options for listing large amounts of offers or a sort by feature option. However, this is something we can easily implement as a phase 2 website-update due to the way that we built the website to accommodate growth in the future. Rooser Marketing was awarded the Telecommunication Standard of Excellence for Tempura Connect – website design and development in the 2017 Webaward Competition. To find out more about Rooster Marketing’s recent projects, click here, or get in touch today via email: info@roostermarketing.com.